1. Place flours in a medium-sized mixing bowl. 2. Add eggs, dashi powder and half of the water. Whisk until smooth. 3. Add soy sauce and the rest of the water gradually, while whisking. 2.. Half-fill the holes with batter. 3. Place a piece of ham in each. 4. Pour batter over until the plate is completely covered. 5. Allow to cook a few minutes. 6. Use picks to divide semi-cooked batter on the plate between the holes. Push batter edges over the hole. 7. 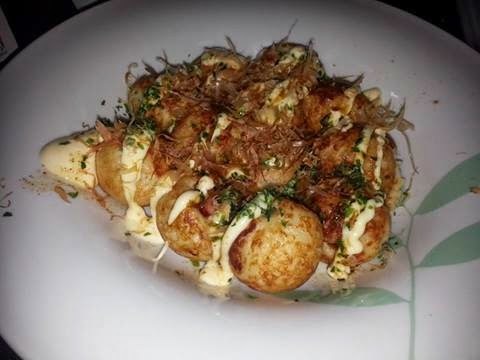 Gently turn each takoyaki into a ball by getting the picks between plate and ball and using a lifting-flicking-rolling motion. 8. When all your takoyaki are ball-shaped, pour a drizzle of oil onto the hotplate in-between the takoyaki - enough that the oil goes into the holes under the takoyaki. This makes the surface of the takoyaki crispy as they actually fry in the oil. Keep turning balls until they are crispy and golden.